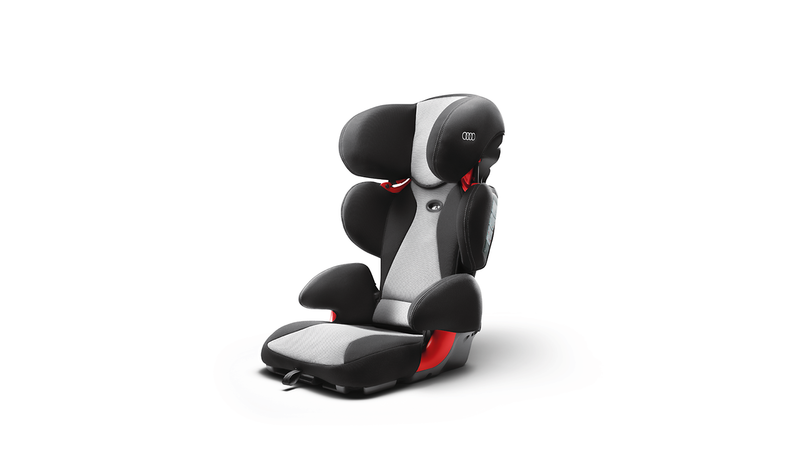 The youngster advanced child seat, in classic titan grey/black, offers the child protection and safety during a journey. The child seat has a belt guidance system as well as height and width adjustable backrest. The backrest and seat can be separated, so that children above 22 kg only use the seat. It is a statutory requirement to use the complete child seat (seat and backrest) for infants weighing between 15 and 22 kg. The child seat is equipped with a removable and washable polyester cover, which is particularly breathable and kind to the skin and has been tested according to the Oeko-Tex Standard 100. It can be folded together and compactly stowed or transported. Attached by means of the vehicle&apos;s 3-point seat belt and ISOFIX anchorage points. The Audi youngster advanced child seat satisfies the ECE-R 44/04 safety standard, valid across Europe, in all points and has also successfully passed numerous tests such as front and side impact crash tests. It is a statutory requirement to use the complete child seat (seat cushion and backrest) for infants weighing from 15 to 22 kg. Pleasant. Adjustable backrest, breathable seat cover.